For older adults, mobility can be a challenge even when weather conditions are perfect. Add a little snow, ice, or rain to the mix, and getting around can be extremely difficult for seniors. With winter’s unique challenges for seniors with mobility issues, there are a few easy measures they can take to keep themselves safe. With inclement weather, we all spend more time in the comfort of our homes, and this includes seniors. It makes sense then for seniors to focus on safeguarding their home with a few simple steps. The biggest thing that seniors can do to ensure their safety in the home is to eliminate or reduce fall hazards. For tips on how to reduce the risks of falls in the home, read this recent article from the Senior LIFE blog: https://seniorlifepa.com/blog/fall_hazards_at_home. Tasks are as simple as removing throw rugs and using assistive walking devices at home. Before weather gets bad, check mobility device batteries and consider having them serviced. Devices like motorized scooters should be kept in working order during the winter months especially. Taking the time to check these items now will ensure that they are working properly when you really need them. Although not an issue that addresses mobility specifically, it is important that any fire hazards are addressed as seniors with mobility issues may not be able to quickly exit a home in the event of a fire. Fires can start from household items such as heated blankets, space heaters, and candles. Make sure these items have auto-shutoff features and that items are unplugged when not in use. Seniors also need to plan their mobility outside the home. Ice, snow, and rain can create challenges that, if not dealt with prior, can become very dangerous. Have a plan with a neighbor, friend, or family member to help with snow removal and salting walkways and driveways. It may also be beneficial to have scheduled visits with family or friends in the home to ensure that someone is checking in on seniors in the winter months. Seniors should also make a plan for when emergencies occur like losing power or heat. Simply keeping flashlights in every room of the house, having a cell phone to reach a neighbor, or keeping heating blankets around for emergencies is enough to ensure seniors have a backup plan. Winter is not the time make unscheduled shopping trips or visit distant family and friends. Seniors should consider staying home when the weather takes a turn. Seniors should also not be afraid to say no to a previously scheduled event or appointment should the weather make traveling hazardous. This tip is an easy one, but it is often overlooked. 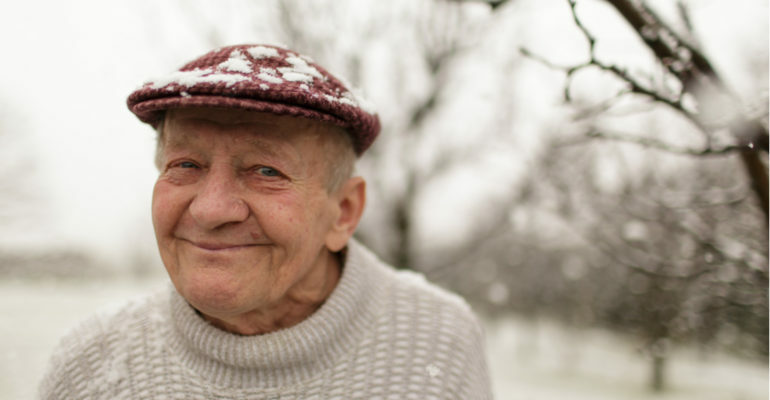 When it’s cold outside, seniors should dress in warm layers and always wear a hat. Proper fitting, sensible shoes with non-slip bottoms are best and will help prevent falls. Assistive mobility devices, like scooters and walkers, can be bulky and hard to transport. However, these devices can be essential in safeguarding your mobility in the winter months. Even seniors who do not normally use these devices should consider using them during the winter months. Devices like canes can provide an extra leg of stability for seniors. The medically trained staff at Senior LIFE includes a team of physical therapists, doctors and nurses. This team works with each member individually to ensure that they are as mobile as possible. Plus, at Senior LIFE there is no limit on the amount of therapy a member can receive. This helps our members to maintain or even improve their mobility. Also, members of Senior LIFE have access to their own assistive devices including walkers and canes, all at no out-of-pocket cost to them or their families. The goal of the LIFE Program is to keep seniors living at home for as long as possible, and out of the nursing home. Services include physicians and specialists, nursing care, physical, occupational and speech therapies, personal and home care, medications, meals and nutritional counseling, eye, dental and foot care, durable medical equipment and other medically necessary services. For more information call 877-998-LIFE (5433) or visit us on line at SeniorLIFEPA.com.